We have partnered with EnerBank USA to offer you flexible, affordable payment options for your chimney and fireplace financing needs. Same-as-cash or low monthly payment options available. 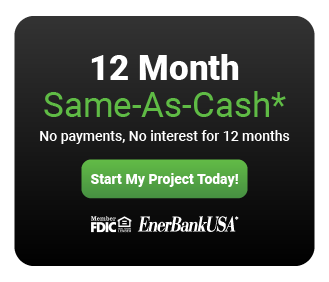 What better company to do business with than EnerBank USA, America’s home improvement lender of choice. Our Express Loan Program offers you hassle free help with payments that can fit your budget and help you with your chimney repair financing needs. Your social security number and your annual income. Click the link below for the loan that you would like to apply for and answer a few quick questions. *Loans provided by EnerBank USA, Member FDIC, (1245 Brickyard Rd., Suite 600, Salt Lake City, UT 84106) on approved credit, for a limited time. Repayment terms vary from 24 to 132 months. Interest waived if repaid in 365 days. 18.58% fixed APR, effective as of October 1, 2018, subject to change. Interest starts accruing when the loan closes. *Loans provided by EnerBank USA, Member FDIC, (1245 Brickyard Rd., Suite 600, Salt Lake City, UT 84106) on approved credit, for a limited time. *Repayment term is 60 months. 9.99% fixed APR, effective as of October 1, 2018. Minimum loan amounts apply. The first monthly payment will be due 30 days after the loan closes.